This House believes there is an important role for the private sector in supporting the delivery of NHS care; welcomes the contribution made by private providers to the delivery of the historic 18-week maximum wait for NHS patients; recognises a need, however, for agreed limits on private sector involvement in the NHS; notes with concern the Government’s plans to open up the NHS as a regulated market, increasing private sector involvement in both commissioning and provision of NHS services; urges the Government to revisit its plans, learning from the recent problems with PIP implants and the private cosmetic surgery industry; believes its plan for a 49 percent private income cap for Foundation Trusts, in the context of the hospitals as autonomous business units and a ‘no bail-outs’ culture, signals a fundamental departure from established practice in NHS hospitals; fears that the Government’s plans will lead to longer waiting times, will increase health inequalities and risks putting profits before patients; is concerned that this House has not been given an opportunity to consider such a significant policy change; and calls on the Government to revise significantly downwards its proposed cap on the level of private income that can be generated by NHS hospitals. Labour has called an Opposition Day Debate today to reveal the full extent of David Cameron’s ambitions to turn NHS hospitals into private businesses, pitting one against another in a competitive market. The Government plans to allow NHS hospitals to devote 49% of their beds and theatre time to private patients. This will open the door to an explosion of private work in NHS hospitals. Labour believes that this plan – coupled with other measures in the Health and Social Care Bill – will result in lengthening waiting lists for NHS patients and increases in health inequalities. Labour believes the private sector has a role to play in delivering world-class care to patients. In Government, we used private sector capacity to bring down NHS waiting lists to their lowest ever level. However, if the Health Bill passes, the NHS will never be the same again. The Bill unpicks the fabric of a public national health care system—a planned system—and turns it into a free-for-all. Our arrogant Prime Minister needs to be reminded today that nobody voted for this re-organisation and that he doesn’t have a mandate to privatise England’s precious NHS. Labour believes the private sector has a role to play in delivering world-class care to patients. In Government, we used private sector capacity to bring down NHS waiting lists to their lowest ever level. We introduced the Independent Sector Treatment Centre (ISTC) initiative to help reduce waiting times for treatment at busy NHS hospitals while increasing patient choice, by letting private companies carry out planned, straightforward procedures such as hip replacements and cataract operations. However, when our capacity needs were met we reduced the use of the private sector – for example in 2007 Alan Johnson announced that there wouldn’t be a third wave of ISTCs. We are clear that there is a difference between using private providers to support the work of the NHS and privatising the NHS. Labour introduced the NHS constitution – reaffirming rights to NHS services, free of charges and with equal access for all. In 2009, Andy Burnham announced that the NHS would be the ‘preferred provider’ of choice when it comes to delivering services. This meant that NHS trusts would be given the opportunity to improve first, before tenders for services from the private sector would be considered. The Tory-led Government’s Health and Social Care Bill is unnecessary, unwanted, wasteful and damaging – and threatens to end the NHS as we know it. The Bill turns the NHS into a full-blown commercial market, putting competition before patient care. They have no mandate for it. David Cameron promised no ‘top-down reorganisation’, the ‘Coalition Agreement’ ruled it out and no-one voted for it. Many thousands of people have already called on the Government to stop. But they are ploughing on, ignoring public and professional opinion, out of touch with Britain. Private providers will be able to cherry pick which services they compete for, and will not have to provide emergency care or treat patients with complex care needs. Sir David Nicholson, Chief Executive of the NHS, has criticised the proposal in the Bill to stop the Government from intervening to rescue struggling Foundation Trusts. The Government’s amendments following the Future Forum changed the wording of Monitor’s duties but not its sweeping powers to force competition. Unlike integration, anti-competitive behaviour is defined by the Bill, as “behaviour which would… prevent, restrict or distort competition” [Clause 60]– which is the exact same wording as the Competition Act 1998 and Amsterdam Treaty. Therefore competition remains a much stronger force in Monitor’s new duties than the Future Forum recommended. Rather than giving more powers to local GPs to decide when and where to use managed competition, the Bill will force commissioners to use competitive tendering even when local clinicians, health and wellbeing boards and the public do not agree. The Bill gives Monitor powers to investigate and direct commissioners to enforce competition. [Clause 71, 72]. In a speech on 10th November 2011, David Cameron declared that he wants the NHS“to be a fantastic business for Britain.” This sentence was then curiously omitted from the published speech on the Number 10 website. Earl Howe told the Laing and Buisson Independent Healthcare Forum that the Bill will create “genuine opportunities” for the private sector to take over large chunks of the NHS. Howe said that though the NHS “will not give up their patients easily”, there were opportunities for those wishing to “enter the fray”. Shirley Williams summed up Lansley’s agenda as “stealth privatisation”. Under Labour, Foundation hospitals were restricted by a cap on their private patient income (PPI). Labour introduced the PPI cap to ensure that giving more autonomy to hospitals would not lead to them prioritising income from private patients at the expense of NHS patients. Labour set the cap at the proportion of PPI a hospital was already generating in 2002/3 – this guaranteed that there was no change in the access of NHS patients to services. As the cap only applied to FTs, in 2009 a modification was allowed to permit Mental Health FTs (that did not exist in 2003) to earn up to 1.5% of their income from PPI. There were also concerns that the cap did not operate evenly, for example caps ranged from zero to 30 per cent. That’s why in November 2009 Labour committed to a comprehensive review of the cap. Furthermore, Labour put forward an amendment at Report stage to retain a cap on private patient income. This was defeated by Conservative and Lib Dem MPs. The Health and Social Care Bill removes any limit on NHS Foundation Trusts’ private income. This means local NHS hospitals will be able to turn more NHS beds into private pay-beds. Coupled with other measures in the Health Bill, this amendment will result in lengthening waiting lists for NHS patients. The Government’s relaxation of NHS waiting time targets means hospitals are free to devote more theatre time to private patients. And they will have a clear incentive to do so and maximise income, with the move to full financial independence and a “no bail-outs” culture where hospitals in financial trouble are allowed to go bust with no Government help. NHS patients could also find that urgent surgery is cancelled if private patients expect to spend longer in NHS intensive care units than is clinically necessary. The Bill’s revised impact assessment (Department of Health, Health and Social Care Bill 2011: Impact Assessments, September 2011, p64, B.155, ) continues to acknowledge that there is “a risk that private patients may be prioritised above NHS patients resulting in a growth in waiting lists and waiting times for NHS patients”. The NHS founding principle that access should be based on need not ability to pay is threatened. There is, however, evidence that a number of trusts, such as the Royal Marsden, Moorfields Eye Hospital and Papworth Hospital, are preparing to substantially increase their private patient work. The author of the listening exercise report, Prof Steve Field, said that the abolition of the cap is an area that “we didn’t put as much in our report as perhaps we could have done.” He summarised the “gut feeling” from the listening exercise as “the private cap should stay because people felt that would provide the protection”. This was because “if you opened the cap it may be more likely to be under…EU law, and from competition and from Monitor”. The Government is now seeking the amend the Health Bill to allow NHS hospitals to devote 49% of their beds and theatre time to private patients, replacing Labour’s stringent private-patient cap. This move reveals the full extent of David Cameron’s ambitions to turn NHS hospitals into private businesses, pitting one against another in a competitive market. In practice, given that the vast majority of FTs are unlikely to get anywhere near 49%, this amendment will have virtually the same impact as abolishing the cap completely. A study published in the Journal of the Royal Society of Medicine showed the NHS to be one of the most efficient healthcare systems in the world. The study showed the NHS saving more lives for each pound spent as a proportion of national wealth than any other country apart from Ireland over 25 years. Among the 17 countries considered, the United States healthcare system was among the least efficient and effective. Pritchard also pointed out that even Adam Smith, the Scottish economist and father of market-based ideology, thought the state was “probably better” at health and education. A study published in the British Journal of Cancer revealed that the NHS was the most efficient healthcare system in the world at reducing cancer mortality ratios. The implant scandal has raised new questions about the future of the NHS and the Health and Social Care Bill. One of the central features of the Health and Social Care Bill is to remove the oversight and responsibility that the Secretary of State currently has for the NHS. If the bill passes, then we will be entering a world in which a future Health Secretary, when faced with similar problems would be able to wash their hands of any responsibility. They continued to warn that the Health and Social Care Bill now before Parliament “provides much less protection for patients should their provider fail than is available to people booking package holidays”. When Labour left office waiting times were at the lowest level since records began. The Government’s controversial re-organisation is distracting the NHS from focussing on patient care and longer waiting times have returned since the election. Sadly, things will get even worse if David Cameron succeeds in abolishing Labour’s cap on the amount of private work hospitals can do, pushing NHS patients further back in the queue. Since David Cameron became Prime Minister, there has been a huge increase in number of patients waiting for treatment. In opposition, David Cameron, Andrew Lansley and the Conservative Party made clear that they would scrap NHS targets. reduction of the 4 hour A&E target threshold from 98 per cent to 95 per cent. There has been a 29% increase in the number of patients waiting longer than 18 weeks for treatment since May 2010. 5,984 patients waited longer than 18 weeks for treatment in October 2011 compared to May 2010. Regionally, 36 Trusts didn’t meet the 90% threshold for the latest figures – 16 more than in October 2010. 4 times the number of patients were still waiting 13 weeks plus for diagnostic tests in October 2011 compared to May 2010. In September 2011, the median waiting time increased to 8.8 weeks, from 8.4 in May 2010. This is the measure that Cameron has used in Prime Minister’s Questions when challenged. Andrew Lansley has reduced the health inequalities component of PCT allocations – giving affluent ‘good’ health areas more funding than deprived ‘poor’ health areas. This means that the Government are treating Kensington the same as Blackpool despite an eight year difference in life expectancy. It is outrageous that poorer areas are once again having to pay the price for David Cameron’s broken NHS promises. We are still waiting for detail on public health funding, resource allocation, input to health service commissioning and the outcomes framework. Instead of focusing on creating meaningful supportive environments to help people make healthier lifestyle choices easier, Andrew Lansley is doing deals with food and drinks companies to label foods better and to sponsor health information campaigns. The Marmot Review commissioned by Andy Burnham, the then Health Secretary, examined international evidence on health inequalities – his recommendations were accepted in full by the last Labour government. The Marmot Review recommended focusing on the social causes of health inequalities and defined the need for an effective, integrated delivery system. A privatised NHS moves away from collective buy-in/social safety net to consumerism/survival of the fittest. Over 40 directors of public health and over 100 leading public health academics signed a letter arguing that the Bill will increase health inequalities, not reduce them. Michael Marmot told the Health Select Committee there is little evidence that the health premium will reduce inequalities and is likely to increase them. The Health Select Committee’s recent report on Public Health warned that the Bill poses a “significant risk” of widening health inequalities. Leaked draft Department of Health guidance Developing Commissioning Support: Towards Service Excellence made recommendations on how a CCG’s technical and back-office functions should be provided from 2013. BMA council members claimed that the leaked guidance was a “smoking gun” confirming fears that Ministers hope to privatise the NHS ‘by stealth’. The guidance echoed Earl Howe’s comment in 2010 that the Government did not expect GPs to become “managers”, but rather to look to “commercial partners” for commissioning support. Andrew Lansley was a civil servant in Norman Tebbitt’s office (who was SOS for Trade and Industry) during the de-nationalisation of public utilities. “Many of these ideas are at the heart of the reform proposals being pursued now by the coalition government”. Sage health insurance is highlighting the “teething problems” of the Government’s NHS reorganisation and tells patients that the only way to get peace of mind is to purchase their private health insurance cover. Saga has been a prominent supporter of the Government’s reforms. 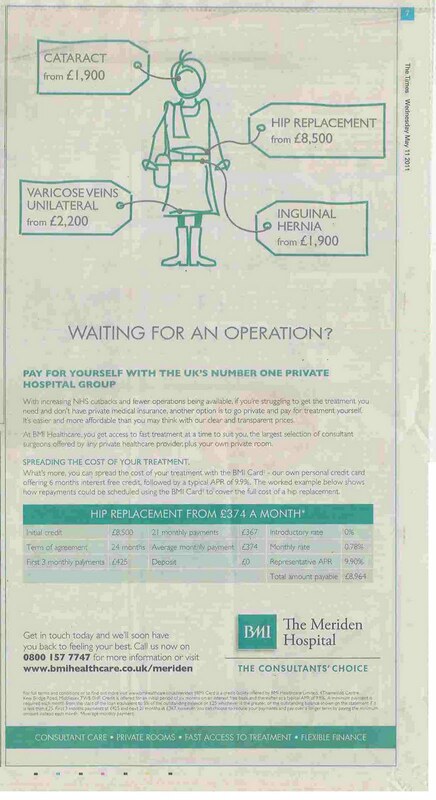 BMI Healthcare, a major private hospital company, has advertised in local newspapers highlighting the tighter rationing of operations available on the NHS. The company has also produced a map of NHS waiting times on its website to encourage NHS patients to go private. BMI is a member of H5, a lobbying organisation that supports the Tory reforms. Spire Healthcare, a private hospital chain that is also part of H5 lobbying for the Government’s reforms, as conducted a survey of GPs to show waiting times are rising, and is encouraging GPs to make more private referrals. Best Health, a private health insurance consultancy’s website is highlighting longer NHS waiting times for diagnostic tests on its website, under the headline, “NHS waiting times increase for diagnostic tests”. The website also sells health insurance. Beat that quote, a private health insurance price comparison website also highlights “concerns such as NHS waiting lists” and recommends patients “leapfrog long NHS waiting lists”. Data from Laing & Buisson analysed by Labour shows that between 1985 and 1997 the number subscribers to private health insurance went up by 46 per cent. Between 1997 and 2009, the number of subscribers fell by 2 per cent. The Government is forcing the bill through Parliament on the back of votes from people whose business interests are set to benefit from it. Research by Unite revealed that Tory peers with poor voting records, but with links to private healthcare have been turning up to vote on the health bill. Lord Coe, director of AMT-Sybex Group, which is the IT supplier to the NHS, and IT is one of many areas that the bill could lead to lucrative new opportunities for health contractors. He has one of the worst attendance records in Parliament, less than 10 per cent – but voted for the health bill.